Rogue Squadron's public grounds. Discuss any non-sensitive material within. The mess-hall is a public area where Rogue pilots may freely interact with other members of the Star Citizen universe. Presale has started. I got 2 Nox. One of each design. Role: Board Technical Administrator - "Got any problems? Ask me." Elfwyn wrote: Presale has started. I got 2 Nox. One of each design. Is this a concierge thing? I cannot find them. "If you heard my shot, you were not my target." You’ve heard the name, but now it’s here. 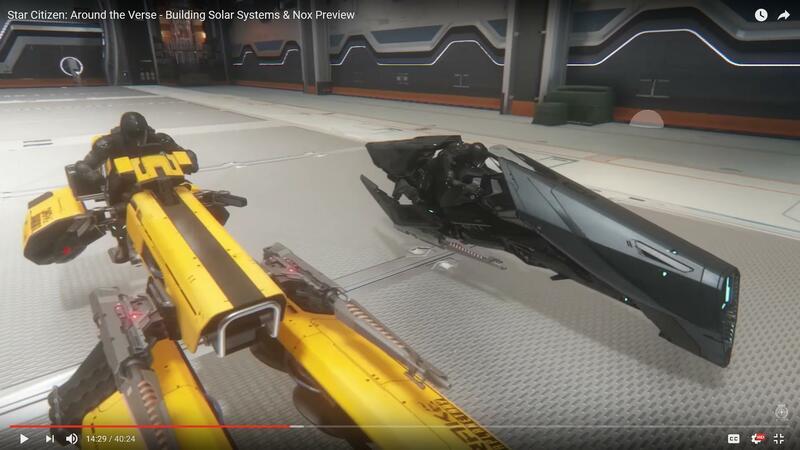 Famed Xi’an ship manufacturer Aopoa is releasing its famous open-canopy speedster, inside the UEE. The Nox is fast, sleek and maneuverable, capable of operating both in the atmosphere and in space. As a proud owner of the Drake Dragonfly, we’re pleased to offer you an exclusive first look at this exciting new open-canopy racer. With the upcoming 3.0 release, the Nox is a perfect ship to whiz across the moons of Crusader or through the asteroids of Yela." Picked up the double pack while I was at work today, really good looking space bike. Deliverence wrote: Picked up the double pack while I was at work today, really good looking space bike. Picked up a pair of Noxes for Lunarwhirlwind and I.
I accidently picked up 4. On my phone it didn't show the double pack nor the Warbond black version. Since I'm not looking to owning a bunch of LTI tokens I wasn't interested in the 5 pack either so I got the silver one. Later I realized from links posted in General chat that a double pack did exist so I picked it up. Then I started wondering what to do with the single extra silver Nox I had. I didn't have anything within $35 I could use the credits to CCU into so after watching the ATV reveal on the Nox I came to decision and purchased a 4th Nox so now I have 2 silver ones and two black ones. As for how I feel about it I really like it. I can easily see it being my go to ground vehicle with the two Dragonflies I already own being used only when I have a need for carrying an extra person or cargo. I always want to have one of those available and I have multiple ships which I think can carry one so for the moment I can justify having 4 because I plan to spread them out amongst my fleet of ships and possibly hangars/homesteads once the PU is out. I also just love how sleek the Nox looks even when compared to the Dragonfly. I purchased the double bikes (Nox and Kue). I really like the design and my mouth dropped when I saw the animations and the like. This will probably be my go to for recon or scouting out my landing zone. The dragonflies I have will be for exploring planet side. A piece of badass machinery! That time of year again when difficult decisions have to be made and for myself my Vanguard along with the BUK's took a hit to make way for the 600i explorer variant.